TORONTO, May 17, 2018 – Now is the time for business leaders to prove themselves as agents of positive change, as the millennial generation is growing increasingly skeptical of “pro-business” sentiment and business leaders. That’s the big takeaway from the seventh annual Millennial Survey released this week by Big Four accounting firm Deloitte. The 2018 report is particularly noteworthy for the demographics of its respondents — tomorrow’s business leaders. Based on the views of 10,455 millennials questioned across 36 countries, Deloitte surveyed a “specific group of this generation,” those who have college or university degrees, are employed full time and work predominantly in large, private-sector organizations. For the first time ever, the Deloitte survey also includes responses from 1,844 Gen Z respondents, born between January 1995 and December 1999, who are currently studying for or have obtained a first or higher degree. The respondents included 525 Canadian millennials and 300 Canadians from Gen Z. According to the survey, roughly two-thirds of respondents from both generations not only believe leaders simply pay “lip service” to diversity and inclusion, they also believe that only formal legislation can adequately advance workplace diversity. 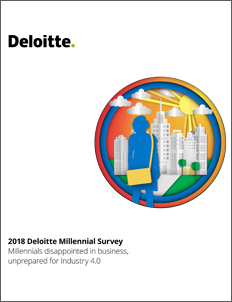 Click on the image above to download the 2018 Deloitte Millennial Survey. The second major finding in the report is the growing trepidation among younger professionals over the digital age — including machine learning, biotech, data and artificial intelligence advancements — which Deloitte broadly refers to as Industry 4.0. 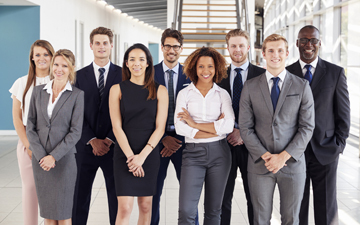 Fewer than four in 10 millennials and three in 10 Gen Z currently in work believe they are fully prepared and have all the skills and knowledge they’ll need. Most are unsure, while a small minority say they feel completely lacking in the necessary skills and knowledge for the Industry 4.0 workplace. Young business professionals who work for companies that embrace the ethos of the digital age — workplace flexibility, workforce diversity — demonstrate a more positive opinion of Industry 4.0. They are the organizations that are better able to motivate and retain younger people. While the seventh annual Millennial Survey from Deloitte shows a “dramatic, negative shift in millennials’ feelings about business’ motivations and ethics,” it also offers business leaders a path forward to making the changes necessary that will attract and retain the best and the brightest talent. It “begins with financial rewards and workplace culture; it is enhanced when businesses and their senior management are diverse, and when the workplace offers higher degrees of flexibility.” Further, young people are looking to their employers to help them navigate the change necessary to succeed in the digital world of the future. When companies fail in these objectives, millennials and Gen Z show an increasing attraction to the gig economy. To download the full report, visit the Deloitte Millennial Survey website. Colin Ellis is the managing editor of Canadian Accountant.